Ugh! You woke up again with red, itchy bites on your arms. And, upon closer inspection, you discovered a cluster of tiny dark spots on your mattress. 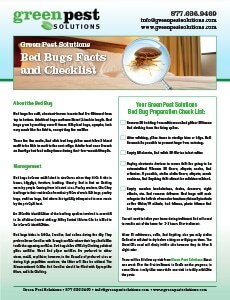 Has your home been invaded by bed bugs? 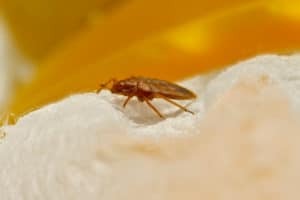 Bed bugs love to take up residence anywhere they can find a nice, tasty, warm-blooded host to feed on, and these tiny reddish-brown pests tend to spread quickly and are notoriously hard to get rid of. 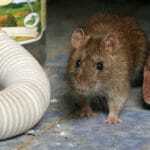 If it appears that these unwelcome guests have shown up uninvited, there are steps you can take to return your home to its rightful owners. Clear the clutter – Even though bed bugs don’t care about dirt, dust, and sanitary conditions, they are partial to clutter because it makes a good place to hide and breed. 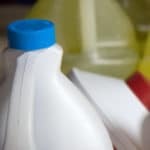 The cleaner and less cluttered your home is, the easier it is to effectively rid it of bed bugs. So get rid of old piles of newspapers, magazines, and other papers, and get organized. Vacuuming and cleaning – Thoroughly vacuuming your home will get you closer to eliminating bed bugs. Treat each room like a bed bug hot spot and vacuum everything, including all types of flooring and furniture, curtains, cracks and crevices, and box springs and mattresses—basically any area that can be reached with a vacuum or its attachments. Be sure to empty the vacuum after each use in an outdoor trashcan. Heat treatment – Bed bugs can’t stand the heat, so treat all clothes, curtains, bedding, and fabrics that can handle high heat by placing them in the dryer. Put the dryer on the highest setting and make sure to keep it on for long enough time. For example, if you are drying clothes after washing them, keep them in an additional 30 minutes once they are completely dry. 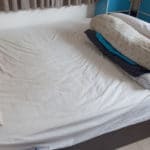 Matters of the mattress – Whether or not you need to dispose of your mattress depends completely on the level of the infestation. 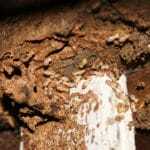 Bed bugs may be on the inside as well as the outside. Wrapping your mattress and box spring in specially-made encasements may do the trick. A high-quality encasement will successfully prevent even the tiniest of bugs from escaping. And, since the trapped pests will not be able to feed, they will eventually die. Intercept them – Install interceptors under the feet or frame of your bed. These special platforms or traps prevent bed bugs from climbing onto your bed. Just remember, for this method to be effective, headboards and bedding also have to be kept off of the floor or away from walls. Otherwise, the pesky creatures will find another way to join you in bed. Pesticides and other chemicals are not always an effective way to eliminate bed bugs and can be harmful to humans and pets. If you choose to go that route, use caution and be sure to follow instructions exactly. Of course, the best way to tackle a bed bug infestation is to call in a professional. Contact Green Pest Solutions today at 877-636-9469 for more ways to protect your home from bed bugs and other unwanted pests.